Enter the author's name in quotations: "j golec". If you're finding too many papers which mention the author, you can use the "author:" operator to search for specific authors. For example, you can try author:bird, author:"r bird", or author:"robert c bird". For more accurate results, go to Advanced Search to search by author, publication. Look for the "Cited by" link below each result. This is the number of citations to this work that are indexed by Google Scholar. Click on that link to retrieve them. Create a Profile within Google Scholar to keep track of your own citations. 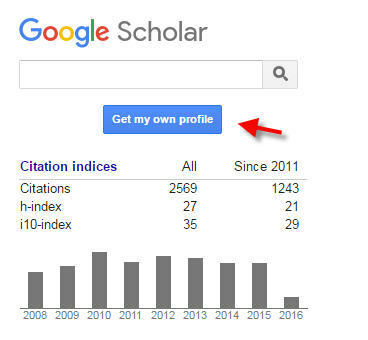 Log in to scholar.google.com and click the “My Citations” link at the top of the page to get your account setup started. Google Scholar results may not be as accurate as Scopus It cannot remove self-citations and so you have to look for them yourself which can be time-consuming. It sometimes has multiple entries for one work which can inflate results. To learn more consult the Help and Advanced search tips page for Google Scholar. Listed below are databases that include a cited reference feature, also note that some references will be hyperlinked to indicate Times Cited in this database. Includes scholarly/peer-reviewed journal articles on a variety of subjects. Click on Cited References on the blue bar. Summarizes scholarly articles about the history of the United States and Canada. 1964-current. To search for cited references, click on Cited References on the blue bar. Scholarly journal articles about nursing and allied health. Includes nursing interventions, management, education, theory, and history. Also includes allied health topics such as physical and occupational therapy. 1981-current. To search for cited references, click on Cited References on the blue bar. Articles in communication, mass media, linguistics, and film studies. Coverage varies, but some back to early 1900s.. To search for cited references, click on Cited References on the blue bar. Summarizes scholarly articles in history of "the world" (South America, Europe, Africa, etc.) excluding the United States & Canada. Articles published from 1954-current. Historical events from 1450 to present. To search for cited references, click on Cited References on the blue bar. Scholarly articles in psychology, plus medicine, psychiatry, education, social work, criminology, social science, business, & organizational behavior. Cited reference searching is available. Comprehensive coverage of cited references from 2001 forward, some cited references from 1998. To search for cited references, click on Cited References on the blue bar. Scholarly journal articles about sociology and other social and behavioral sciences. Includes culture & social structure; economic development; evaluation research; family & social welfare; management and complex organizations; policy planning. 1963-present.Cited references from core journals from 2002 forward; cited references from all other journals from 2004 forward. To search for cited references, do an author search then click on the Cited by link in the record.